rather exceptional at that time. 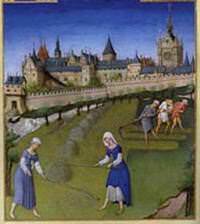 The disposal and utilization of land in the Middle Ages was ultimately a seigneurial prerogative and hence the limited instances of structural innovation in the form of enclosures and convertible husbandry can be explicated, to a large extent, by looking at the political and economic dimensions of manorial estates. Peasants, however, were not powerless entities since they were, after all, the ones who engaged in direct production, either in their own plots or in demesnes. Hence, any effort to innovate, especially on a large scale, presupposed their consent and cooperation.